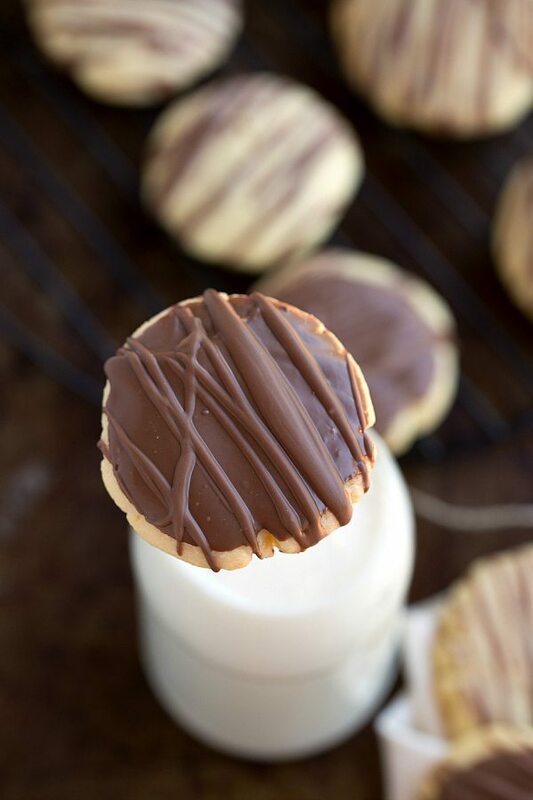 These shortbread cookies are melt-in-your-mouth soft! They are dipped or drizzled with milk chocolate adding a delicious burst of chocolate flavor. Shortbread cookies have always seemed like the epitome of Christmas cookies to me. And here we are nearing the end of March (and SPRING has started!) and I’m bringing you the recipe anyways. Well, I didn’t actually have cookies in mind. Originally, I was trying to create a recipe for a type of shortbread crust for a different dessert I had in mind. Buuuut cookies happened instead after said dessert wasn’t quite what I was hoping for and I was left with a craving for some good shortbread. There was a little bit of contemplation about saving this post for Christmas, but there is no way I could wait that long. There has got to be other people that crave shortbread cookies during March right?! And these cookies are dipped and/or drizzled in milk chocolate which makes some of the tastiest cookies ever. I know shortbread cookies sometimes can be a bit plain, but with all this chocolate…oh my word. Not to mention these are some of the easiest cookies to make! Before we get to the recipe, I have just a few tips to make these cookies the best they possibly can be. First off, arguably the most important ingredient in shortbread cookies is the butter. I like to get a very high quality butter that I know will make these cookies taste awesome. Don’t use any kind of margarine or butter spread – it will make for some not so tasty cookies. The second ingredient that I think is quite important is the vanilla extract. The vanilla extract can really flavor these cookies well so use a good high quality extract. If you have Mexican vanilla, that is delicious in these cookies. Second, besides the actual ingredients, the rolling and baking of these are important too. Make sure they aren’t too thick when you roll out the dough – a super large and thick shortbread cookie has the tendency to make you want a few cups of milk as it can be a bit dry and bland. Also I like to just slightly under-bake these cookies. It makes them softer and (in my opinion) more flavorful when they are pulled out of the oven just 1-2 minutes earlier. One other trick you can use to keep soft cookies is to let them cool most of the way on a cooling rack and then place them in a large Zip-loc bag. Seal the bag and let them continue to cool for a few minutes. The cookies shouldn’t get steamy in the bag at all (that means they didn’t cool long enough), but there will be a little moisture left in the bag leaving them super soft. Leave them in the bag while you are prepping the chocolate to drizzle or coat the cookies in! And final tip, use good chocolate! With a cookie with so few ingredients, the ingredients really matter. I love using a really high quality milk or dark chocolate to use on these cookies. You can use an actual chocolate bar or chocolate chips – that doesn’t matter, just make sure it is a good quality chocolate that doesn’t taste waxy. Oh, I guess one other thing…pour yourself a glass of milk and enjoy! In a large bowl, beat together the butter and sugar until combined. Add in the vanilla. Beat in the flour, cornstarch, and salt on a low speed until a dough forms. Knead the dough into a ball and tightly wrap it in plastic wrap. If it is at all dry or crumbly you may have packed in too much flour to the measuring cups or had too solid of butter. Add 1-2 tablespoons more butter to make a solid thick dough. Place in the fridge for at least 30 minutes to an hour for the butter to chill in the dough. Roll out the dough so it's just under 1/2 inch thick. Use circle cookie cutters and cut out the dough. Place the circle dough pieces on a baking sheet. As soon as the edges start to lightly brown they should be done. For the chocolate drizzle, combine the chocolate and vegetable oil in a microwave safe bowl. Microwave for 30 seconds and then stir. Microwave in 15 second bursts stirring in between for at least 15 seconds until smooth. Either dip the cooled cookie in the chocolate, or use a spoon and drizzle the melted chocolate over the cookies. I love a good shortbread cookie, especially one that has been dipped in chocolate. Pinned. Yum- these look amazing. I’m all for great cookies outside of Christmas season 🙂 Will definitely try these soon! They look great, especially because they are with chocolate! I’m always drawn to soft cookies, so this is perfect, Chelsea! 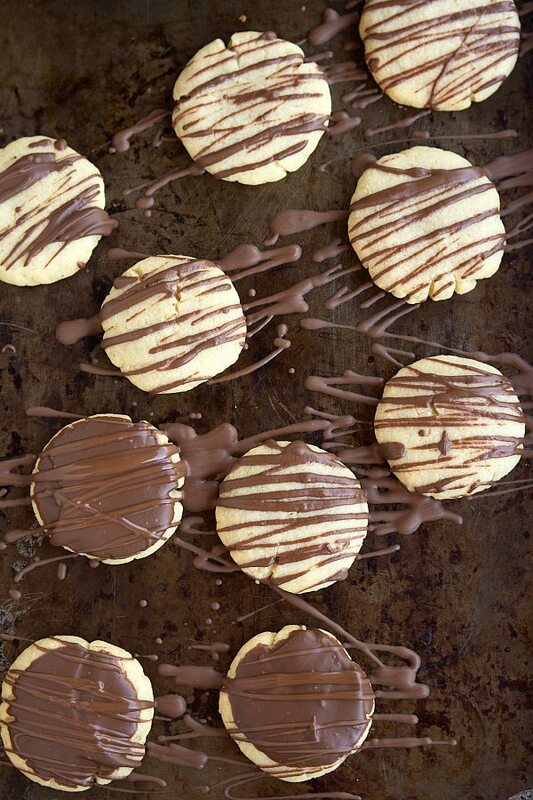 I love the looks of these shortbread cookies, especially drizzled with chocolate. What a great way to start out my morning. Pinned! Soft shortbreads are the best! And chocolate drizzle make them all the better. Love these! Girl, I’ll eat a shortbread cookie any time of year, it’s my favorite kind! Love the chocolate drizzle! Years ago I made some shortbread cookies with cornstarch and really did melt in your mouth! I’d forgotten all about that recipe, and these look even better with all of that luscious chocolate! Pinned. 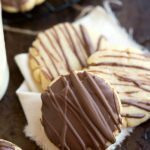 I love shortbread cookies and can eat them all year long! These look amazing with all that chocolate and I love how soft they are too! I am so glad you shared these now instead of waiting for Christmas! 🙂 I love a good shortbread all year long. These look amazing and like chocolate heaven. Love! I’d never describe shortbread cookies as plain! & these certainly are the furthest thing from plain! They look awesome, Chelsea! Mmm! 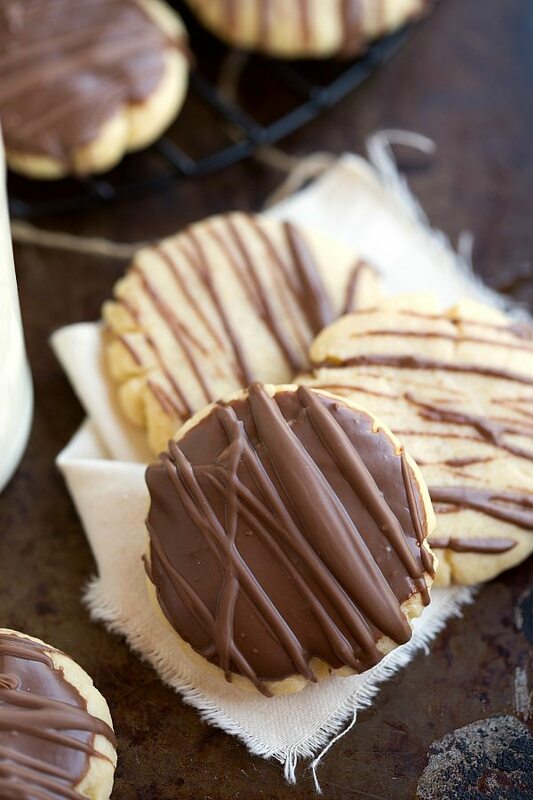 I don’t love shortbread cookies until they’re paired with chocolate then they’re irresistible! I love that these are so soft. They look perfect! These cookies are the best shortbread cookies I’ve ever had. And my father-in-law’s new favorite cookie on the planet! I’ve got his presents covered for the rest of time 🙂 Haven’t tried them with the chocolate, they are amazing on their own. Thanks for sharing, I will be following you. These look amazing but I can’t get the dough to work. 2 times I’ve tried it now and the dough just turn to crumbs. I’ve followed exact measurements. Any advice? Hmm sounds like you might be packing in your flour — try spooning and leveling the flour for best results 🙂 Also, you can always add some more butter if they are too crumbly so you shouldn’t have to throw out any batches. Just add a tablespoon or more until the dough comes together well. So, so happy to hear that! Thank you so much Lauren 🙂 And how great to hear they were wonderful with the gluten free flour blend! Thanks for a great recipe. Can you tell me if you used salted or unsalted butter? Would these cookies be too soft for rolled fondant decorations? Why not say 1.5 c butter instead of 12 tbs, like most recipes. Your first line turned me off. But the chocolate turned me back on. 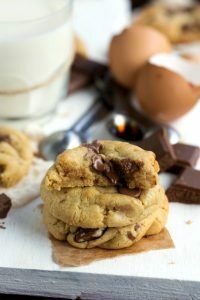 I love soft cookies and I have a shortbread pan that I’ve been wanting to use, would these cookies turn out well if I baked them in it?